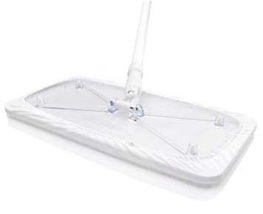 Texwipe mops and cover refills are designed specifically for cleanrooms and offer premium contamination control. 100% Polyester mop covers assure low contamination levels, high absorbency, excellent abrasion resistance and chemical tolerence. Some Texwipe mops can be sterilized for cleaning and disinfecting aseptic areas.